OK, from the start let’s make it clear – this is not, definitely not, a Take That musical. 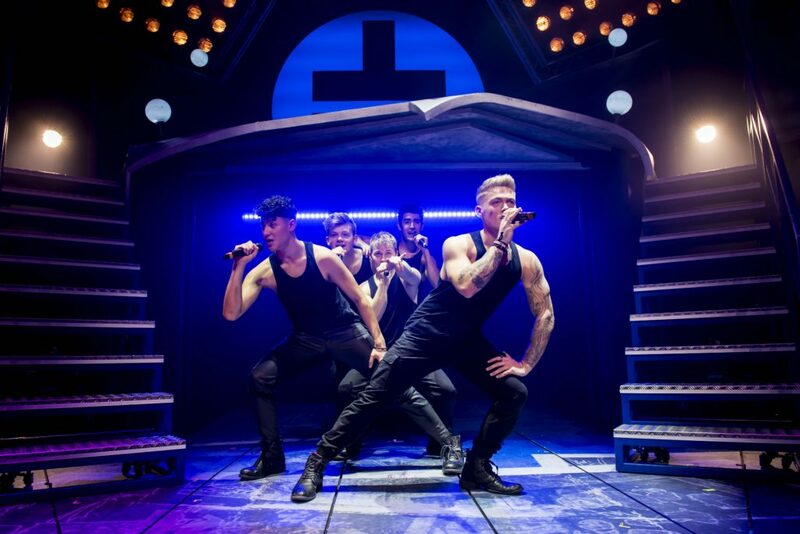 Set in Manchester, featuring five lads in a hugely successful boyband and blasting out the back catalogue of aforementioned supergroup, we’re clear from the onset … this is not, repeat not, a Take That Musical. As we walk into the auditorium, we’re transported back to 1993 with a giant screen on stage rolling through the pages of Ceefax – a little lost on some of the younger audience members, but to us of a certain age, pure nostalgia. As the show starts we’re in what could be any teenaged girl’s bedroom of the time, with walls adorned with Smash Hits posters. We meet young Rachel (Faye Christall) who brings us up to speed about how she, and her mates Heather (Clayton), Debbie (Rachelle Diedricks), Claire (Sarah Kate Howarth) and Zoe (Lauren Jacobs) are in love with a certain boyband. Skip forward twenty five years and Rachel (Rachel Lumberg) wins a competition to see her beloved pop heroes in Prague. Having drifted apart from the others, she tracks them down and invites Heather (Emily Joyce), Zoe (Jayne McKenna) and Claire (Alison Fitzjohn) to see their childhood idols. Throughout the plot opportunities are created to shoehorn in some of Take That’s biggest hits, with scenes that cleverly switch from us following the girls/women to us being in the audience of a concert. Most people will know that the lads in the band (A. J. Bentley, Yazdan Qafouri, Nick Carsberg, Curtis T Johns and Sario Soloman) were picked in the BBC contest ‘Let it Shine’. In the year and a half since, they have become a close knit five piece and the show (touring since September last year) has become the fastest selling musical theatre tour of all time. However, Take That are masters of their game, from lad band to dad band, they have always been talented showmen who excel at everything they do so it’s hard not to compare the boys in The Band with Howard, Jason, Robbie, Gary and Mark; therein lies a problem – however hard they work, they are never going to compete either vocally or performance wise. Don’t get me wrong, AJ, Nick, Curtis, Sario and Yazdan are talented young performers, but there were a few duff notes and the choreography at times wasn’t quite as polished in places as it should have been for a West End stage. The set (Jon Bausor) was fun with a few nice surprises. However, it did look a little like it was created just to be easily toured with. There were some clever use of video projection (Luke Halls) to flesh out scenes but this was inconsistent as for every outstanding part there was one which was rather unexciting. The Band tries to pack in a some messages along the way, some of these work and add a touch of sentiment to the show, but others feel a little unnecessary. There are some parts which may raise a few eyebrows in this day and age – dodgy Polish accents and fat jokes to name a couple. This isn’t outstanding musical theatre and doesn’t deliver anything new. However, if you take it at face value, it is a fantastic, fun experience and certainly one you’ll Never Forget.